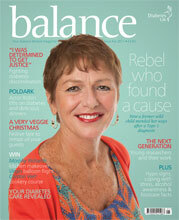 “Balance ” is the in-house magazine of Diabetes UK. It is well produced, readable, informative and is available on-line. I’m interviewed in the latest edition. thank you for the info: I wil buy it for my uncle…. on December 2, 2011 at 12:47 am | Reply Pat H.
Thanks what I was waiting to hear. Another cookbook would be great. Thanks. Right hand column of the blog? on November 15, 2017 at 2:33 pm | Reply Pauline Hazell. I wish to purchase the Balance Magazine in hard copy format. How do I do that. On-line reading is not for me!